Get excellent protection with great range of motion with the Joint VPD 2.0 Knee Pad. 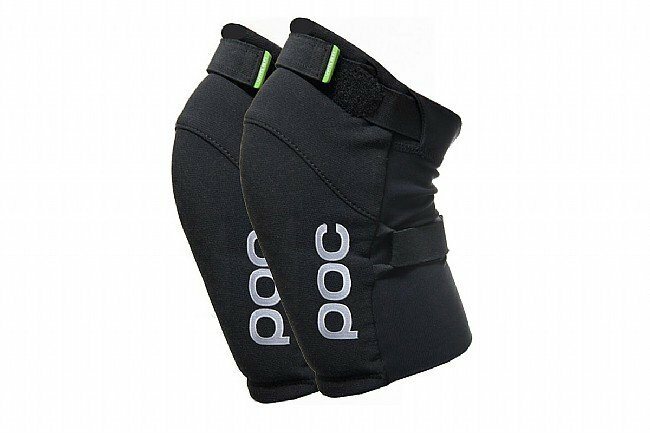 POC knows their safety gear and these knee pads are no exception. By using Visco-Elastic Polymer Dough (VPD), they are able to deliver a pad that is both very comfortable and also highly protective. This material, developed in POC's labs, is flexible and molds to the shape of your body, but upon impact it stiffens up and absorbs much of the kinetic energy from a crash. Holding this wonder material is a sleeve made from stretchy, kevlar reinforced fabric that is very durable and perforated for heat and moisture control. The Joint VPD 2.0 Knee Pad is available in Uranium Black. Medium – 41 - 45cm. Large – 45 - 49cm. X-large – 49 - 53cm. GREAT protection for DHendurofreeride applications, but a bit heavy and hot for trail riding. Fit and finish are great and they are really nice. I say great protection, but I haven't actually crashed my knee yet, but I am very confident these pads will suffice. Apart from going downhill, I have pedaled with them and they are super comfy. My only beef is that they're probably more than I need, but that's no fault of the pads themselves. I just mention it so you know these are beefy so prepare for the extra room if you need to haul them up. For reference, I do a fair amount of DH, but nothing super aggro, with a mix of XC riding. I would recommend these without reservation if you want a big pad without shin guards. Fit, protection & quality excellent. A little heavy for all-day rides. Just spent two weeks in the Swiss Alps running these and had a very good experience. They are warm and a little bulky, but protected very well during the one high-speed off into rocks that I had. We pedaled 4-8hr a day with me wearing them half the time. I'm 5'7 150 lbs (mostly leg muscle) and wear a Medium. My chick is 5'5 140 lbs and wears the same size.